I’ve been using Windows 8 regularly ever since the pre-release versions were offered up to the public early this year. Initially I wasn’t a huge fan of the new tile interface, Charms Bar, and other areas in Windows 8 that altered my experience so much that it hurt my productivity for a little while. If you’re running into a similar issue there are tools like Skip Metro Suite that remove some of the Windows 8 features to make it feel a little more like Windows 7 while still giving you the performance benefits that Windows 8 brings to the table. We’ve covered some of your options to bring back the Start Menu in Windows 8, and if you’ve already gone that far you might as well consider using Skip Metro Suite to take the extra step. 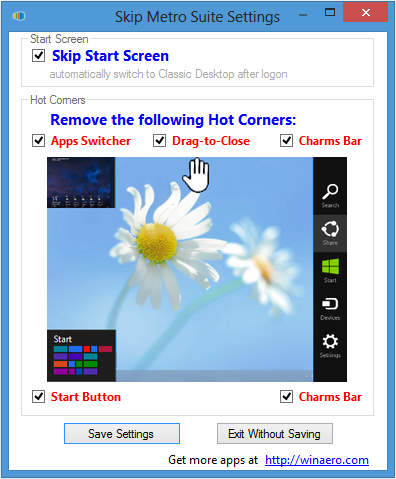 The tool will let you bypass the Windows 8 tile interface so that you immediately boot to the desktop, and you can also choose to disable the different hot corners that appear when you drag your mouse to the corner of your monitor. That means you can turn off the app switcher, start button, and Charms Bar. I do want to point out that disabling these options, however, does not disable the tile interface completely. Hitting the Windows key on your keyboard will still take you to the new Windows 8 tiles. For me I’m not actually using a tool like this, nor have I added a third-party Start Menu alternative. I want to try and embrace the new way Microsoft is trying to do things, and view the tile interface as more of a full-screen Start Menu with widgets. Once I started to treat it that way it only took about a week to get used to the new interface, but I don’t have to use it very often.